Urban Sketchers Seattle: the big picture! 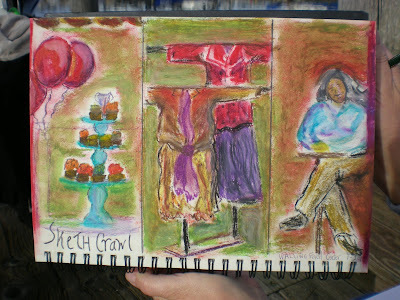 Our Wallingford Center adventure immortalized by a new sketchcrawler, Shirley Dronen! Balloons, cupcakes, haute couture and sketching say it all! I like the combination. The clothes are fun! Great colors and nice to see something in Pastel.